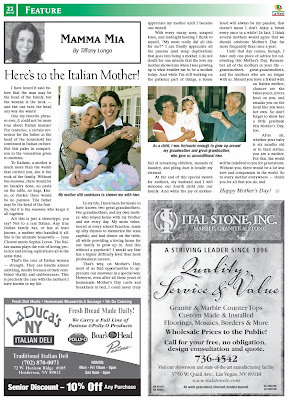 Una Mamma Italiana: Una Mamma's article on "mammas"
Una Mamma's article on "mammas"
If you ask me, every day could reasonably be mother's day and we would still be under-appreciated!!!! So although a bit late, here is one mother's tribute to all the mammas out there -Italian or not. This appeared in May's issue of La Voce Newspaper. ENJOY! Your main picture on the top of your blog- is so darn cute. Very Creative! thank you! a friend of mine shot us "in action!" In my house, all the action is in the kitchen, of course! Listen to me on the CUCINA CHATTER Radio Show! Tune in every Tuesday from 10 .am. - 11 a.m. Pacific Time. Pull up a chair in host Lorraine Ranalli's cucina! I come on in the "upstairs kitchen" around 10:50 a.m.
Want an email each time I post a new entry? Cugine Corner with "Johnny Meatballs!" La Voce Newspaper - my column, "Mamma Mia!" Italians R Us - my column, "Una Mamma Italiana"
D'ITALIA - Italian food Headquarters!